There’s a revolution going on in management, and it’s being spearheaded by new methods like Holacracy. Surprisingly, these new and innovative management methods can often ignite a hotbed of controversy and upheaval in certain circles. That might be a bit of hyperbole, but if you’ve been a manger of a project, then you know that people take their management tools, methodologies and organizational structures seriously. Some hold these beliefs with a fundamentalist fervor. However, any project manager worth their deliverables knows that long-term success requires an openness to change, where one listens to a chorus of ideas. It’s self-destructive to become complacent and reliant on one particular way of doing things. It’s in that spirit that we devote ourselves today to one of the newer organizational structures: Holacracy. Holacracy is a decentralized management and organizational method. The authority and decision-making power within this type of governance is distributed throughout the Holarchy of a self-organizing team. In other words, there is no overriding managerial hierarchy that holds responsibility for the organization. Ternary Software, a company based in Pennsylvania, developed this system, which has since been adopted by companies and organizations across the globe. Ternary founder, Brian Robertson, defined the organization method in a Holacracy Constitution. In it, the core principles and practices are outlined. The word Holacracy comes from holarchy, which was first used in 1967, with the publication of The Ghost in the Machine by Arthur Koestler. Its roots are Greek, where “holons” means whole or units that are autonomous and self-reliant, while remaining dependent on the greater whole. A Holacracy removes the hierarchical structure of a traditional management system, but that doesn’t mean that anarchy breaks loose. There is a structure, and roles within that structure. But those roles are not unique to one person; an individual can hold many roles at once. Note that a role in Holacracy is different from a job description. It does, however, have a name, purpose and optional “domains” to control. The person in that role is accountable for those responsibilities they are tasked to perform. Those roles are defined by what is called a circle, which is another way of saying team. Through a collective process, a role is given and updated regularly. This allows for the circle to quickly adapt to new changes or needs. Circles are self-organizing teams, though they are not self-directed. While the overall Holacracy is not hierarchical, individual circles are. Each is assigned a purpose and is accountable to its broader circle for this work. However, an individual circle works within its group to devise the best course for achieving the goals assigned to it. They have their own meetings, assign their own members roles and are responsible for carrying out their own work. Each circle is responsible for the process of making and revising its roles and policies. Integrative decision-making is the process promoted by Holacracy to initiate changes in governance, such as amending or criticizing a proposal. It takes relevant input from all parties and makes sure those changes are part of the needs of the roles and the larger needs of the organization. It’s more than just a popularity vote. The collective and integrative process of the circle, with each member having autonomy and decision-making authority, requires that each member of a circle fulfill certain duties. In a sense, it’s the opposite of a traditional management setup, in that individuals don’t need permission to act unless it’s based around a policy or asset, such as spending money. Individual circles are connected to broader circles in two ways: via the roles of the lead link and the rep link. These two roles are responsible for sitting in on their own circle meetings but also in the meetings of the broader circle. This way the larger goals of the organization are in alignment with the work of each circle. Holacracy is action-oriented and fosters innovation. It’s founded on autonomy, but it has internal processes to curb autonomy when it can threaten the success of a project. Holacracy is a democratic process. This is apparent when circles meet weekly to report and give updates on the project, which leads to discussions open to all circle members. Furthermore, circles use something called a triage, which focuses discussions on concrete next steps, keeping the discussions from devolving or being dominated by the louder voices in the room. In theory, Holacracy allows every team member to flourish and pursue their best work by removing unnecessary hierarchy and bureaucratic red tape. Forbes contributor Steve Denning wrote that Holacracy is not really non-hierarchical. While there is great emphasis on democratic decision-making from all corners of the group, the structure is actually highly hierarchical. While individually circles work under their own governance, collectively they are defined by a strict hierarchy. The trend towards a boss-less or flat organizational structure has been buzzing around business and management for years. But some companies, such as Medium, have given up on Holacracy. They said, “It was difficult to coordinate efforts at scale,” according to the Harvard Business Review. Of course, the attraction to Holacracy is due to the fact that organizations are always on the lookout for ways to become more reliable and better at adapting to change. Being reliable provides predictable profits for shareholders, meeting regulations and keeping a stable workforce. Adaptability means being flexible to meet changing needs. But organizations must find a balance between the two objectives. While both are important, if reliability or adaptability overpowers the other, the organization can fragment and lose its leverage. Self-managing teams can place an organization in that sweet spot. Depending on the organization, it can be important to determine exactly what that right amount of self-management looks like. For example, a very large organization can benefit from adopting parts, if not the whole, of Holacracy. Is Holacracy Right for Your Organization? To see if Holacracy is right for your organization, ask yourself these three questions: what needs to be reliable, what kinds of adaptations are important and what organizational forms produce the right balance? It makes sense to use self-managing methods like Holacracy if there’s a need for a high level of adaptability, such as in a high-paced, fast-changing work environment, where quick decision-making is more important than cost. Startups are a likely candidate for such a management system. But for businesses that are founded on reliability, such as retail banking and defense contracting, a more traditional model is ideal. How much hierarchy and process does a company need to stay together as a cohesive unit? It can help to see how other similar companies have structured themselves and explore the wins and losses to see if there’s a precedent to follow. 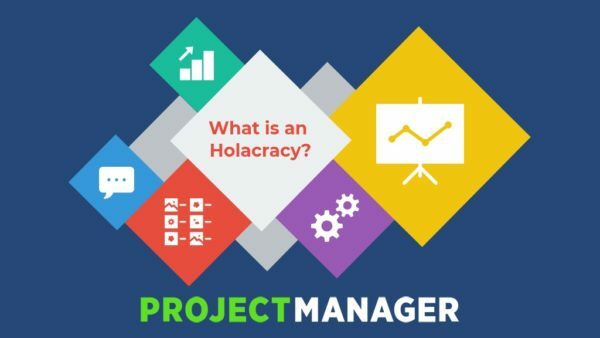 Whether Holacracy is for you or not, the need to have the right tool to facilitate whatever management style you prefer is a crucial and often overlooked aspect of managing anything. ProjectManager.com is a cloud-based project management software that offers the tools a self-managing or hierarchical company wants. See for yourself by taking this free 30-day trial.